I recently shared an easy game day appetizer recipe for Cheeseburger Muffins that’s perfect for those times you are feeding a crowd of hungry sports fans. 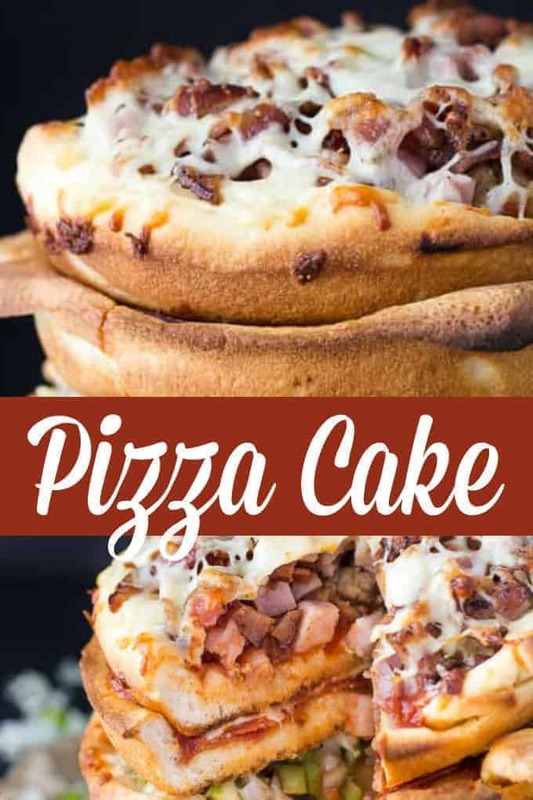 For smaller gatherings, I’ve got another fantastic recipe: Pizza Cake. Your friends and family won’t believe their eyes when they see it. Let’s just say when I brought it out to serve to my friends, there were lots of “Whoa” and “OMG”. It’s a showstopper. If you’re ready to get your “Game On”, this is the recipe for you. It may look crazy huge and elaborate, but it’s actually quite easy to make. 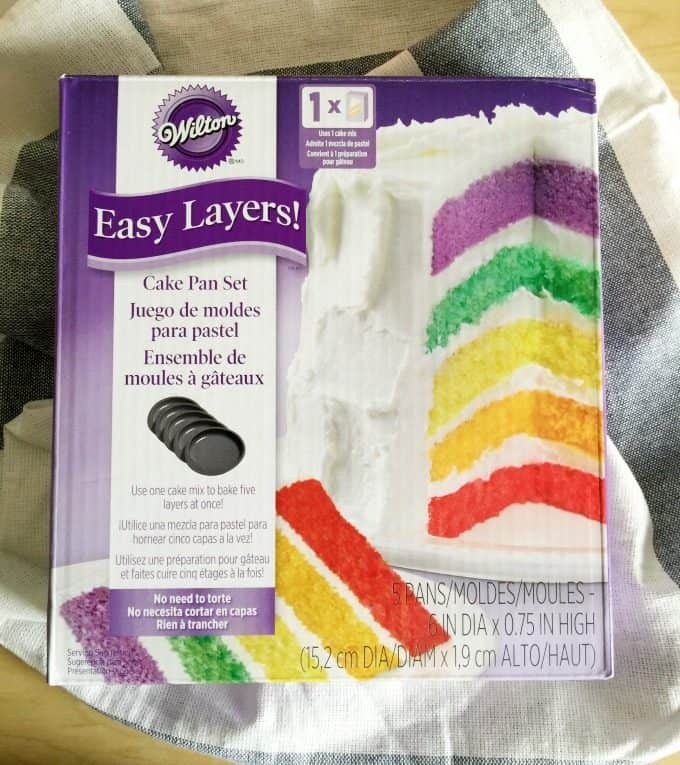 It all begins with a Wilton Easy Layers! 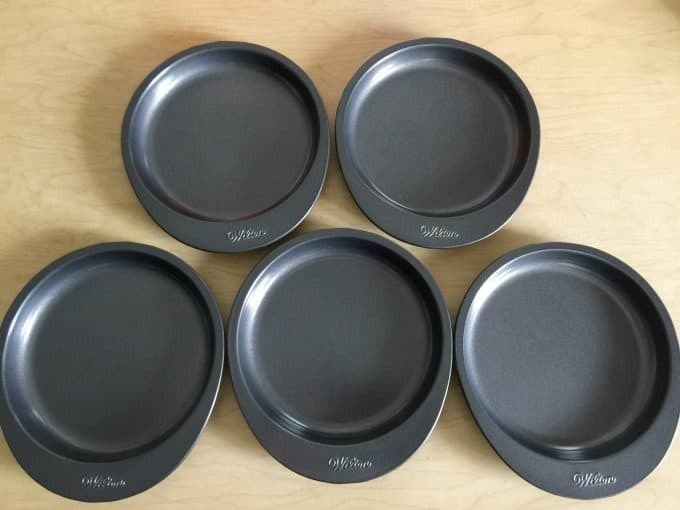 6 Inch Cake Pan Set. Normally, you’d use this set to make something sweet like a layered cake. I’m thinking outside the pan today and making a savoury treat. This set works beautifully to make individual pan pizzas. 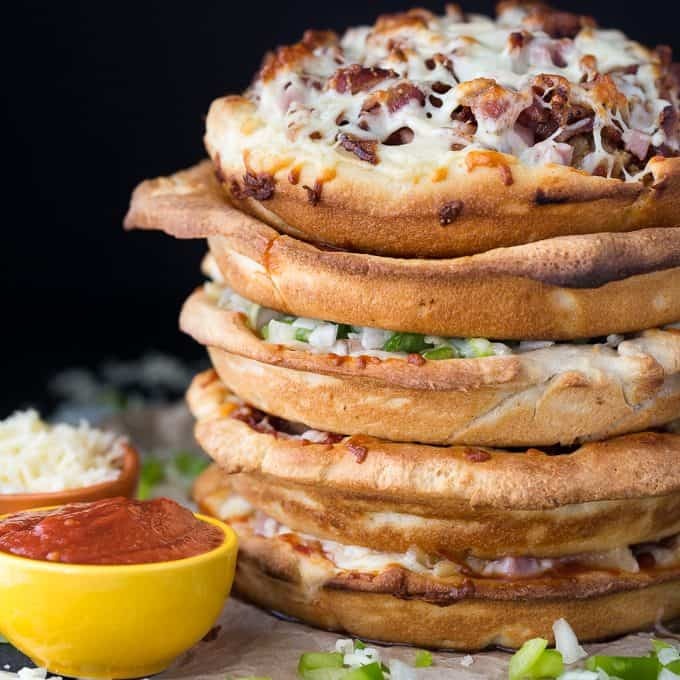 The Pizza Cake is basically just layers of different kinds of individual sized pizzas piled on top of one another. You can save some time by using refrigerated pizza dough unless, of course, you prefer your homemade version. I like easy recipes so I went with the ready to bake dough. Because these pans are small, they can all fit in the oven at the same time. You need to par bake the crust before you add on your delicious pizza toppings. I suggest prepping ahead by getting all your ingredients measured, chopped and/or cooked. Do it the day before your expecting company so then you have less to do when your friends arrive. Plus, you’ll have more time to enjoy the game instead of working in the kitchen! Feel free to follow my recipe to the letter or use your own favourite pizza toppings for your cake layers. This recipe is versatile so pretty much anything goes! The pizzas bake in the oven a second time, all together again, and then it’s time to get it ready to serve. 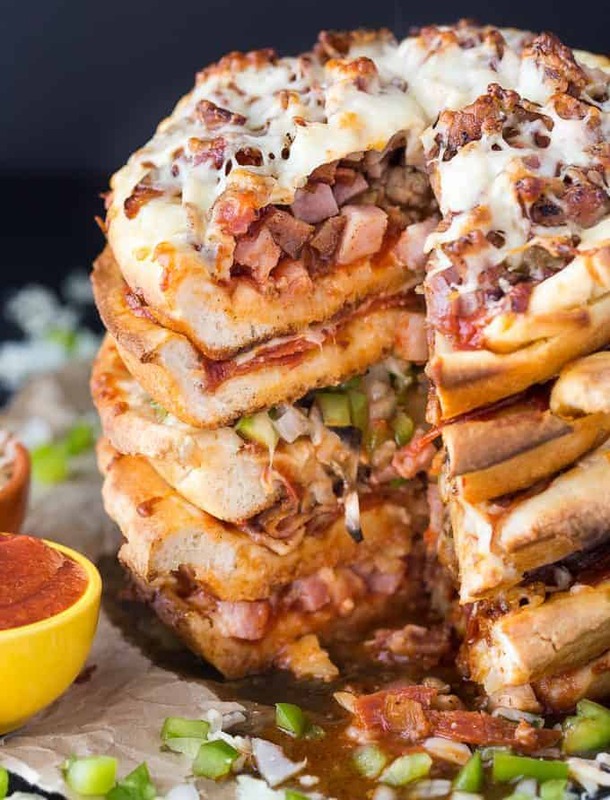 Grab a large plate and start piling pizza on top of pizza until you have a five-layer pizza cake. Just looking at it is making me crave a big piece! To serve, you cut into it with a sharp knife like you would a regular layered cake. Have lots of paper towels nearby because it can get a little messy. It’s PACKED with toppings as you can see! How your guests choose to eat it is up to them. My cousin grabbed the entire thing and opened her mouth really wide to get a nice big bite. My daughter, on the other hand, preferred a daintier approach and ate hers with a fork and knife. Despite the different eating styles, they both echoed the same sentiments. This was one pizza they’ll never forget. Music to my ears! 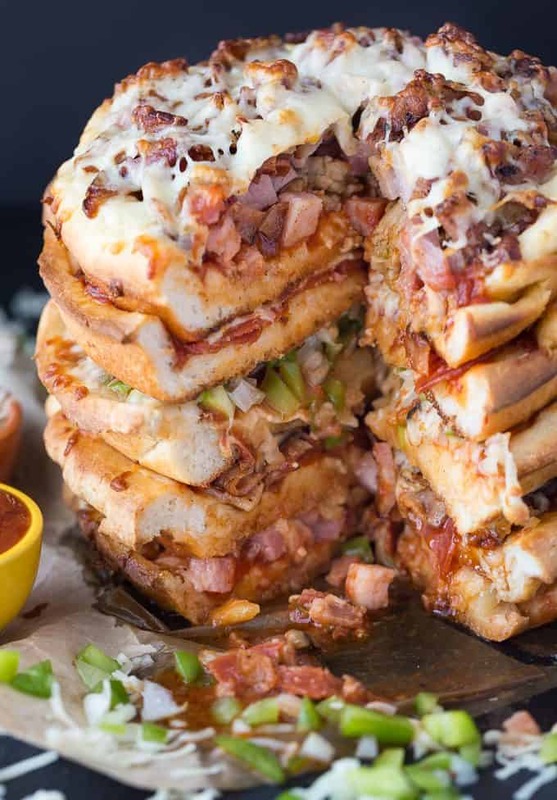 I guarantee your friends and family will be talking about this Pizza Cake for weeks, maybe even months, to come! I know my family will be mad if I don’t make it again especially when the game is on. You might also enjoy these Pizza Rolls or Chicken Caesar Pizza. Are you ready to get your “Game On”? What’s on the menu at your place? 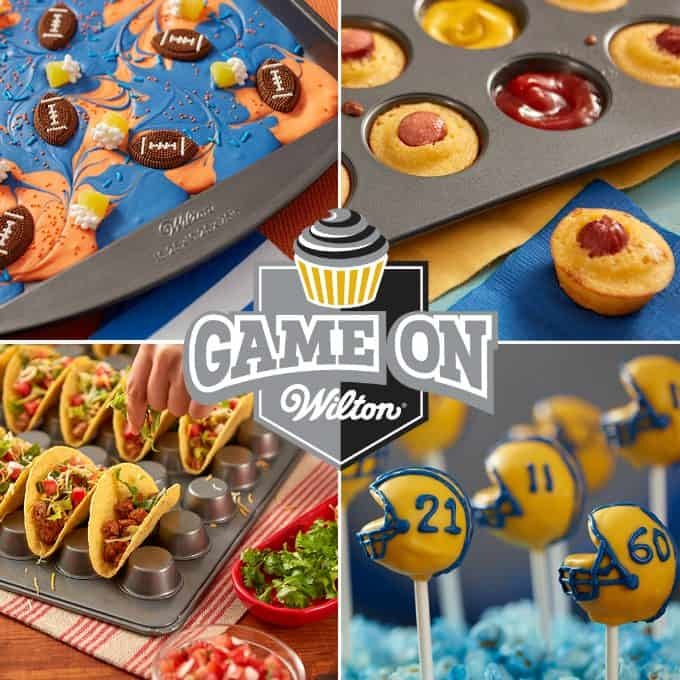 Check out these other awesome game day ideas from Wilton. This five layer cake is a real showstopper and pizza lover’s dream! Surprisingly, it’s not that hard to make with the right tools. Grease each pan in a Wilton Easy Layers! Cake Pan Set with cooking spray. Preheat oven to 400F. 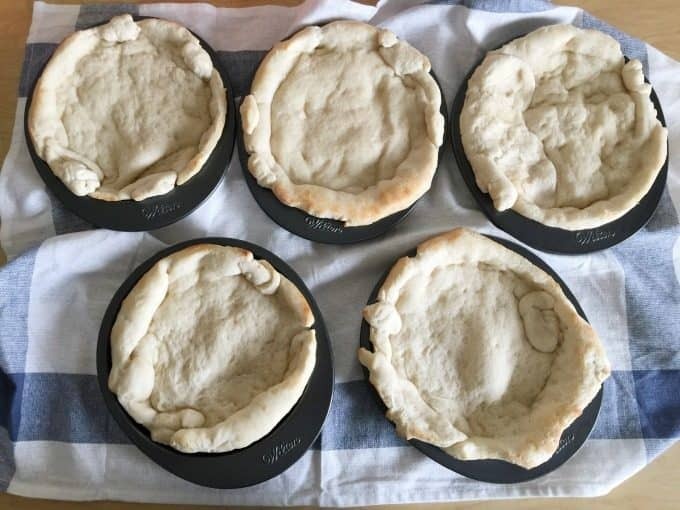 Cut the pizza dough to fit each pan. Press with your fingers to cover the pan’s surface including the sides of the pans. 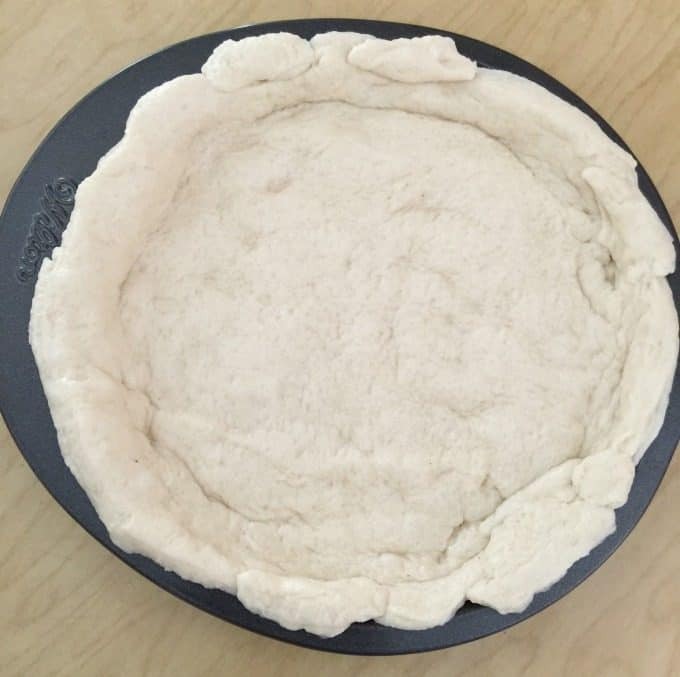 Bake pizza dough for 6 minutes and remove from oven. Top each pizza with around 3 to 4 teaspoons of pizza sauce making sure to leave space around the edges. Top pizza sauce with 1/3 cup pepperoni and cover with 1/4 cup cheese. Top pizza sauce with 1/3 cup pepperoni, 1/3 cup ham, Italian sausage and 1/3 cup bacon. Cover with 1/4 cup cheese. Top pizza sauce with 1/3 cup mushrooms, onions and green pepper. Cover with 1/4 cup cheese. Top pizza sauce with 1/3 cup mushrooms, 1/3 cup bacon and 1/3 cup pepperoni. Cover with 1/4 cup cheese. Top pizza sauce with pineapples and 1/3 cup ham. Cover with 1/4 cup cheese. 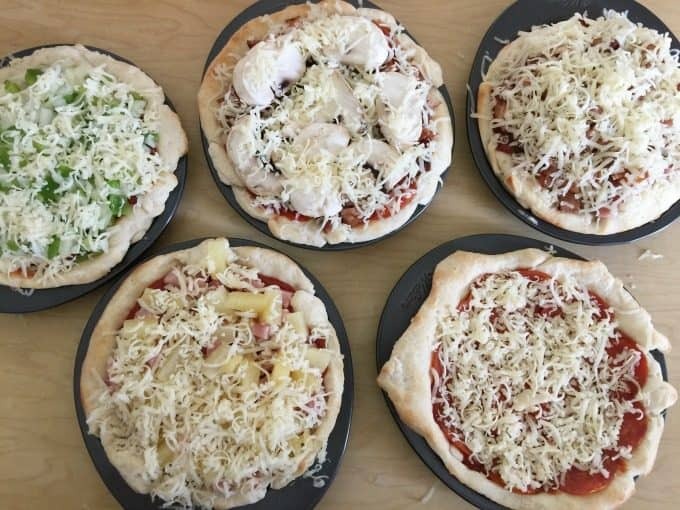 Place pizzas in oven for an additional 10 minutes or until crust is golden and cheese is melted. Remove pizzas from oven. Carefully place one pizza on a serving platter. 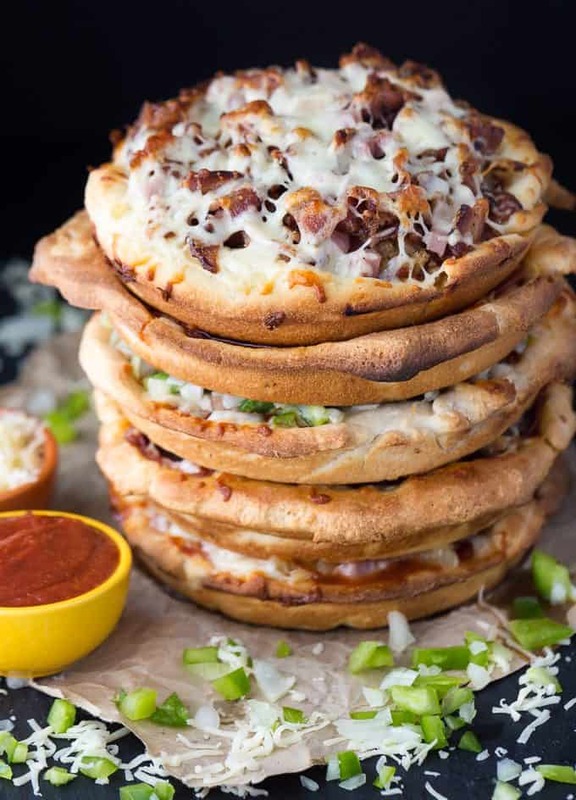 Top with the second pizza and continue to stack the pizzas in whatever order you like. Cut pizza cake into slices to serve. Looks so good – but I would probably be lazy and not layer them. 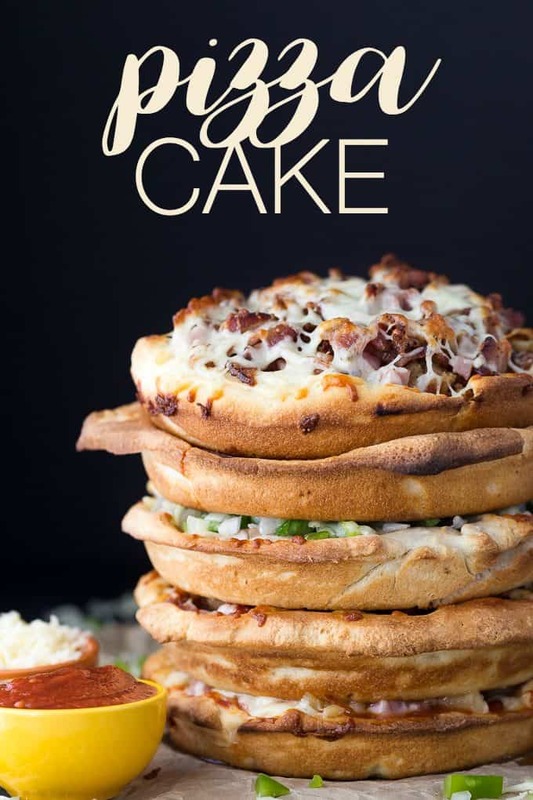 Wow, never thought of pizza cake. Looks amazing! I love that cake pan too! This looks like a delicious way to make pizza. Interesting idea. I’m not sure if my family would like it or not -they have such different tastes and one is allergic to cheese. I love the creativeness though. Pizza Cake!! Looks absolutely mouth-watering…my kids would love it! This is a pizza lovers dream! I love all of the possible flavor combos you could make. What a clever idea! I think I like the idea of pizza cake for dinner and rainbow cake for dessert!!!! This is an impressive looking dish! Genius idea! I would LOVE to try this recipe- I know it would impress a lot of friends and family. Its huge! Need good knife. Oh my gosh that looks good! That’s the most amazing thing I’ve ever seen. A Pizza cake? Neat. OMG this is freakin’ brilliant!! That is one of the coolest ideas I have ever heard. My kids would FLIP for this. Holy. Moly. This has to be the best variation on pizza I’ve ever seen. It’s like a 5 times deep dish pizza! Yum. Wow, this is super creative! At first I thought it was going to be sweet toppings, but this savory combo is really neat! Your pizza cake looks amazing! My daughter and husband would love it! We love game day, so I usually make my awesome wings and pair it with pizza and other dishes people bring over. That looks and sounds delicious. Perfect for a birthday dinner. This is a very interesting idea! I would’ve never thought of something like this, but it would be fun on a game day or something like that. That is a whole lot of pizza. I could serve this on game day. Everyone will love it. This looks so good. My daughter just saw this with me and said she would prefer to have it in two smaller cakes. It wouldn’t make a difference to me, delicious either way. Oh my goodness, this is a great idea! I bet my son would want this pizza cake instead of a traditional birthday cake for his birthday! That is such a creative way to make and serve pizza. In fact that would make a big splash if you served that at a holiday celebration this fall or winter. Pizza cake is something the kids would just love, something new and very different for them!! 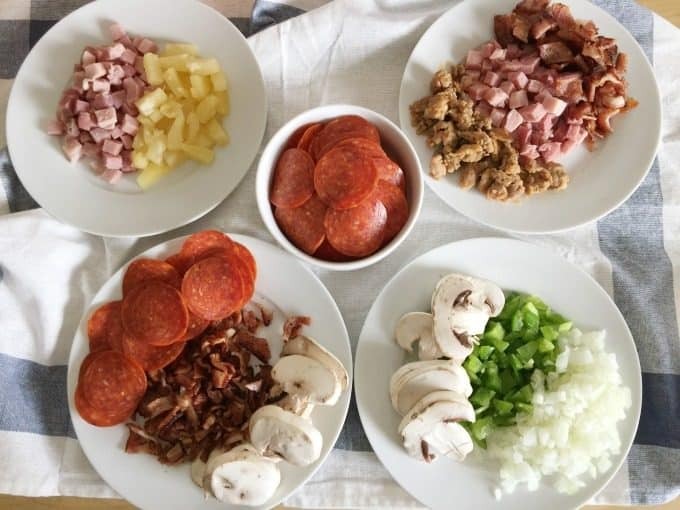 This looks like a delicious way to make pizza. Can’t wait to try it! Now that is what I call PIZZA! Such a clever idea too. I love that it can be customized to anyone’s perfect pizza dream. I never would have thought of this. Oh my goodness! Pizza is my one true love. And you just made me drool! I have to try this! It looks AH-MAZING! This is such a fun idea! Would wouldn’t love a slice of that?! My pizza loving kid is turning 9 soon, and this would be such a fun way to celebrate. Love all the layers! There is so much joy in pizza upon pizza like this. I’m all about the pizza cake! I am always looking for cool new recipes. This is something my family is going to love. I am excited to give this a try. 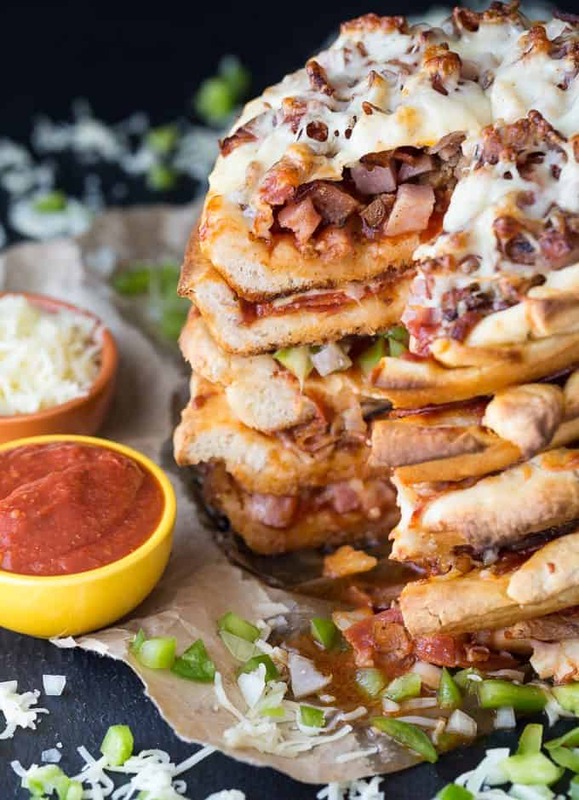 Pizza cake is an amazing idea. I will have to get the ingredients I need to make some this week for dinner. wow this looks yummy. i would def enjoy. wow. The pizza cakes look perfect for a snacking idea.They look delicious and I will make them for our next game night. When I first read the post Pizza cake and I thought how can you make a pizza cake, and I see how it is done. I have never heard of a pizza cake. I really want to make it. We love pizza at our house. This looks so fun, my kids would love this! This is a great idea! My granddaughters will love it when I make it for their next party. Or I man not wait and fix it for dinner. Oh gosh…this is genius!! I LOVE this idea! What a fun idea, we would really have fun with this at our Pizza Party! Hope you are having a great day and thanks so much for sharing with Full Plate Thursday.